“On the 12th of May, my boy never made it home for dinner, last night – he did. On exactly the 100th day since his disappearance, I received a photo from an angel who had been taking care of him since he was found battered and bruised across town. This is that photo. When I saw it, my heart stopped, I couldn’t breathe, it was him. 100 of my darkest days had finally come to an end. No more nightmares, no more “what-ifs”, no more self-loathing – the torment was over. 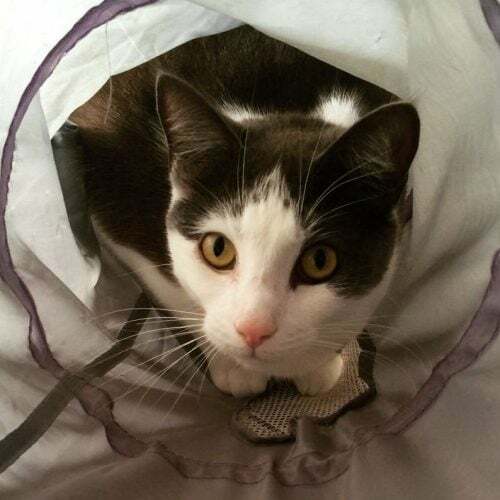 Seeing this photo of my gorgeous boy, unharmed and healthy, and as happy as ever, was a fantasy I’d dreamed about many times. This, in truth, however, and as ashamed as I am to say, was a fantasy I’d all but given up hope in realizing. As the immediate hysteria ensued, my phone rang, it was the angel. After a few moments of incoherent attempts at speaking from beneath our tears, we hurriedly began to reveal what we’d been through over the past 100 days of our lives. For me, his disappearance sent me into a downward spiral, but for this angel, his appearance in her life had saved her from hers. I had always pondered the thought that perhaps Disco and his beautiful soul were required elsewhere, that perhaps someone else needed his healing presence more than I did. Well, I guess now I have my answer. A few hours later, after Disco and the angel had their final play together, he was returned to his ecstatic father, in the house he’d previously called a home since he was just four-weeks old. It wasn’t quite the blissful reunion I’d fantasized about, but was a reunion nevertheless. His time away has obviously been traumatic for the both of us, so it’s understandably going to take some time for the shock to wear off, and to realise that we are finally, after everything we’ve been through, together again. 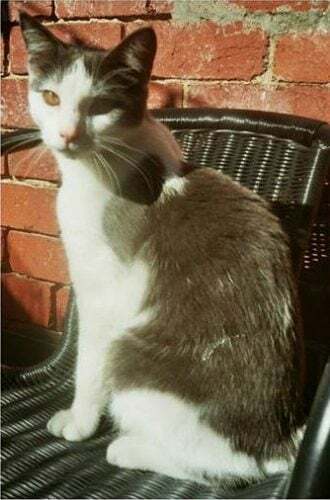 White and grey domestic shorthair Cat, went missing in Fitzroy on 12 May 2016. Disco is male and just under 2 years old. He is long and lean and very friendly. He loves adventuring around the neighbourhood, but is always home at night for a feed and a cuddle. If you have seen Disco please contact us via the Contact Form on this page. We are very distraught not to have seen him for so long. 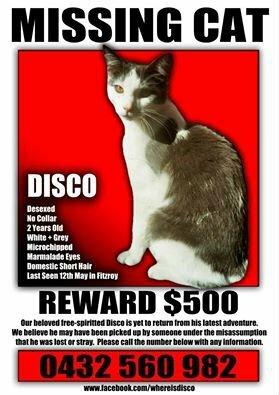 Please share this page to your social media accounts to help bring Disco home. Thank you.